When Wofgang Rihm emerged in the late 1970s and early 1980s on the German contemporary music scene, he was categorized by the critics in a movement which they dubbed “new simplicity”, and whose other most prominent members were Manfred Trojahn and Hans-Jurgen von Böse. Seen from today, almost 20 years hence, the notion is surprising: Rihm’s music is far from simple. But it has to be understood in the context of those days, as a rejection of the rules, constraints and strictures of late-serialism and a will to come back to a method of composition which, while fully drawing on the playing techniques and expressive gamut developed by the most advanced contemporary music, was more instinctive and eclectic. 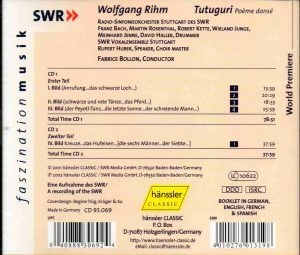 But again, seen not from the standpoint of the compositional methods and processes but from that of what is being offered to the listener, Rihm’s music in Tutuguri (1982), originally conceived as a “poème dansé” (danced poem) for speaker, chorus and large orchestra but (like Ravel’s Daphnis & Chloe) perfectly convincing as a large concert piece, is NOT simple, NOT easy listening and inconspicuous. On the contrary, it is rough and raw, violent, aggressive, cataclysmic, but also highly expressive and effective. One of Rihm’s main sources of inspiration in those years was Antonin Artaud, the half-nut (and in my opinion even more than half) French (that explains it) writer, author of the famous “The Theatre and Its Double” and the concept of Theatre of Cruelty. “Tutuguri, The Rite of the Dark Sun” is a prose poem, part of the radio play “Pour en finir avec le jugement de Dieu” (“To Have Done with the Judgment of God“), describing some sort of primitive ritual, or maybe some nightmare (text provided in the liner notes). Artaud’s ritual theatre was for Rihm the trigger for unleashing the raw power of music. I would personally call Rihm (like Birtwistle, with widely different compositional methods) a “post-Varesian” composer, because of his taste for music that is almost constantly in a state of paroxysm and his recurring use of strongly pounding or simply subtly coloristic (as at the begining of the second tableau, track 3) percussion passages employing many exotic instruments. 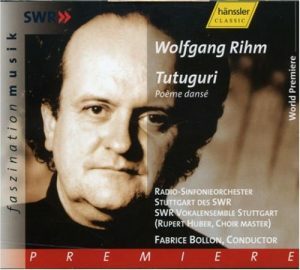 Rihm’s Tutuguri is evocative of some primitive, barbaric ritual, with pulsating and dogged ostinatos. The last movement (CD 2) is an impressive, 38-minute of pounding drums and shouts. Quite unique it seems to me in the history of Western classical music (Xenakis maybe?) and quite daring I find in its provocativeness. I also enjoy that, true to his Artaud model, Rihm is willing to go way beyond the boundaries of “good taste”, as at the end of the third part (track 4 at 25:00) where he has the speaker intone guttural shouts and grunts. Rihm came back to Artaud in at least two other stage works: in 1991, in his opera Die Eroberung von Mexico (The Conquest of Mexico), and in 1994, in another piece of music-theatre which I know only through its entry in the composer’s catalog: “Séraphin, Versuch eines Theaters – Instrumente/Stimmen/ …nach Antonin Artaud ohne Text” (Seraphin, Essay of a Theatre – Instruments/Voices/ …after Antonin Artaud without text”).